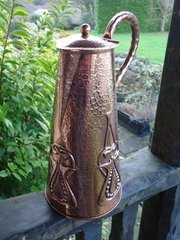 Arts & Crafts copper lidded jug by J & S Pool of Hayle in Cornwall with a Glasgow school design. Offered in an excellent condition. It has been cleaned to remove the old lacquer which the Hayle brothers often used. Height 29cms, Width from handle to lip 19cms. Diameter at base 15cms. 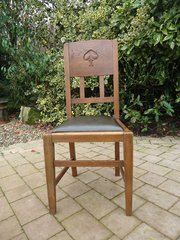 Arts & Crafts oak chair designed by William James Neatby 1860 - 1910. with a stylised tree to back.This has a recently upholstered green leather drop in seat. The chair has been cleaned and polished and measures 101cms high, 45cms wide at front of seat. Depth 42cms. Seat height 48cms. Offered in a good, firm and used condition. 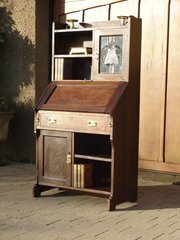 Arts & Crafts fumed oak bureau bookcase with leaded glass door. This has a good fitted interior and cupboard to base and top. Height 150cms. Width 76cms. Depth 45cms. Writing height 74cms. This has been cleaned and waxed. There are minor repairs to strengthen the hinge and the lock on the top cupboard is missing but door stays closed firmly. This has been cleaned and waxed and would make a fine addition to any Arts & Crafts home. Ivorine Liberty label to interior of top drawer. 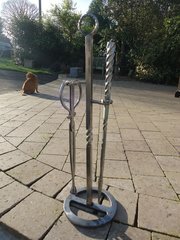 Beautiful Arts & Crafts fire irons o stand made by Archibald Carne ( 1897 - 1968) the Blacksmith of Truro, Carne exhibited at the Newlyn Gallery and also at the Red Rose Guild in Manchester. This set consists of a poker and tongs on a stand. Both the stand and tongs are stamped. The stand measures 50cms in height and 19cms in diameter at the base. Offered in excellent condition. 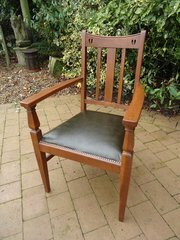 Arts & Crafts oak arm chair designed by E.A. Taylor, the Scottish Artist and Architect 1874 - 1951. with split hearts to top rail. Offered in good condition having been cleaned and waxed and given a new studded green leather seat. 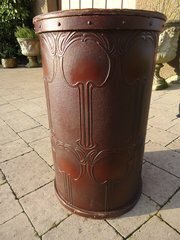 Height 99cms. Width at arms 60cms. Depth 55cms. Seat height 46cms. Arm height 71cms. 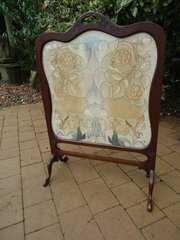 Pretty Arts & Crafts Victorian walnut framed screen with a beautifully executed silk panel of flowers. The colours are soft and I think original and not faded. Offered in very good condition with just a few scratches to the frame Height 93cms. Width 65cms. Depth at feet 32cms. Arts & Crafts oval copper mirror with apples and leaves to four sides. Good large size being 72cms x 57cms. The mirror plate is 58cms x 43cms. Offered in a good clean condition with a few very minor flecks to mirror plate shown in third image. 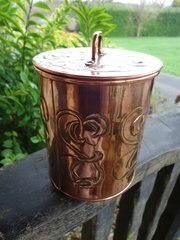 Arts & Crafts copper lidded jar made for either tea or tobacco. There is a design of stylised buds to top and sides. Offered in good condition with the lid sitting snugly. Height to top of handle 14cms. Diameter 10cms. 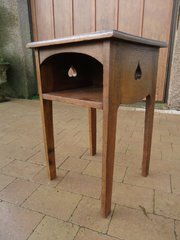 Rare Arts & Crafts oak bedside table made as part of the Athelstan range for Liberty with a pierced heart to both sides and an open front. Offered in good original condition having been cleaned and waxed however there are d few old burn marks to legs as shown - part of its history. Height 70cms. Width 46cms, Depth 45cms. 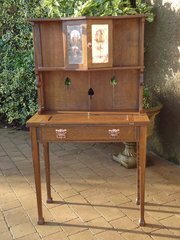 Unusual Arts & Crafts oak bureau as retailed by Liberty with three pierced spades to back and copper panel with seed heads to door of cupboard. Fall front opens on drawer which as two pretty copper handles. Pierced hearts to sides and a useful shelf each side of cupboard. Lots of interesting detail make this a very decorative item. Just one door of the cupboard opens. Offered in good condition having been stripped and refinished. It comes in two parts for delivery. Height 143cms. Width 81cms. Depth 39cms. Writing height 75cms. 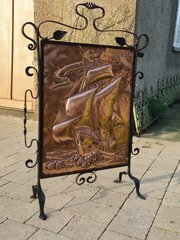 Arts & Crafts Newlyn school copper fire screen mounted on a wrought iron frame and attached with brass balls. It depicts a galleon in full sail on the waves. Good heavy quality item which matches well with a coal n=box just listed. Offered in good condition Height 95cms. Width 65cms. Depth at spade feet 26cms. Rare Arts & Crafts Leatho hat box. This company made many fire screens for Liberty. As can be seen this box shows considerable wear but could be used for many purposes. A fun decorative item with its original label to base. Height 51cms. Diameter 32cms.